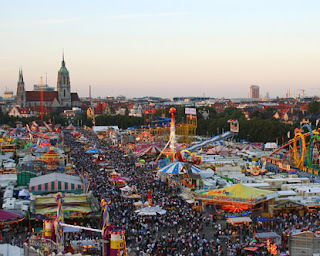 Since it is Oktoberfest month here at JGF lets start off with a few Oktoberfest related stories. A part of me isn't really surprised and I'd be curious to know how this was promoted over the last few years. Something tells me that the Ft. Bragg MWR didn't really move with the times. I guarantee the bottles will come swarming in. Those Germans couldn't handle the embarrassment if their premier festival had a beer shortage. Some good tips in this if you travel across the pond to the big one. We have Red Robin's near us. I may have to go try this...but I must admit I'm hesitant. Looks like Sarah is going to have a new project for JGF! An interesting idea but their kickstarter campaign needs a lot of help if this is going to become reality. A very informative article on what it takes to get started in the commercial craft brewing industry. Your American politics article through a Canadian lens. Remember what Lincoln said. Pumpkin brews aren't getting covered till next month, but here's a recipe to tide you over. Somebody needs to try this out and report on it. Market saturation is coming for macrobreweries and once arrives the craft beer industry better be prepared. Here's a countdown that is sure to piss you off in some aspect, beer snobbery at its finest. The biggest news is that JGF is welcoming a new writer into the fold. Craig Jones, a frequent commenter on the blog has joined the writing team and will be bringing his thoughts and food knowledge to beer reviews. In addition he will be taking a closer look at the exploding Southern beer scene. Welcome aboard Craig. Remember to follow us on Facebook, Twitter, Untappd, and Google+. Just click on the widget in the upper right corner and it will take you where you want to go. Thanks for stopping by.